OPINION — Unless you’ve been living in a cardboard box behind HEB for the past few weeks, you’ve probably heard the hue, and of course cry, from the anti-gun crowd over the issue of 3D printed guns. Cody Wilson, who owns an Austin-based company called Defense Distributed, has been haggling with the courts for years over the legality of making his 3D gun plans available for download on AlGore’s interwebnets. And he won. And then he lost. Or something. Now, if you aren’t familiar with the concept of 3D printed guns, here’s a synopsis of the situation. Three dimensional printers were invented a certain number of years ago. I’m vague on the exact timeline, because I don’t care to do research. A computer can be programmed to tell a 3D printer to build, say, a fork, and the printer can, amazingly, make a fork. Which is not as impressive as the telephone, but still pretty neat. But it takes the printer so long to make a fork that you’ll either starve to death or eat with your fingers before it’s done. The printers were astoundingly expensive at first, so the average person was not interested in buying one, since they could get 48 plastic forks at Wal-Mart for $1.69. But guys saw potential, and when the cost of 3D printers dropped from ‘I have to sell a kidney to afford one’ to ‘I can get by without a refrigerator,’ guys started buying 3D printers and making forks. And cups. And other things you could buy a lot cheaper. And then some guys, like Cody Wilson, figured it might be possible to use a 3D printer to build a gun. So he tried it, and it worked. It took forever, of course, but still. The only problem was that Cody’s first 3D printed gun exploded when he shot it. So that could have gone better. But Cody figured that was a minor detail that could be worked out, so he didn’t give up. After several attempts, and some metal parts, Cody managed to build a 3D printed gun that didn’t blow up until the third or fourth shot. So progress was being made. Granted, the gun was lousy, and cost about 50 times what a good gun would have cost at a gun store, but guys don’t care about that. Success is success, no matter the price. Over time Cody’s guns got better, and he decided to make the plans available on the internet, so anyone could, in their own home, build a lousy, exorbitantly expensive, ugly gun. But the courts said no, hence the years of litigation, until Cody won, and the courts said OK.
You may wonder why it was deemed legal for Cody to sell the plans for 3D guns over AlGore’s net. The answer is basically freedom. Since Cody wasn’t selling guns, but only plans, he didn’t need a Federal Firearms License. The endeavor falls under the freedom of speech guaranteed by the first amendment to the Constitution of the United States. So there never should have been a question. But then, the day before Cody was supposed to be allowed to make the plans available, a federal judge said No. Because a lot of people are afraid of freedom. 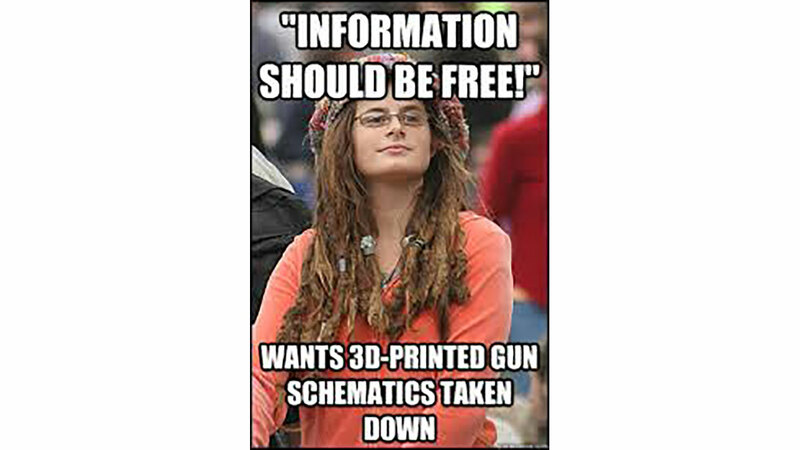 The fear is that criminals, who can’t legally purchase a gun because of their felony status, will be able to download plans and make 3D guns and kill us all. The reasoning was that criminals can’t get guns now. Which they can’t, unless they want to. This all makes perfect sense, of course. A criminal would obviously rather spend thousands of dollars and weeks of complicated study to build a sorry excuse for a firearm than spend a few bucks on the street to immediately buy a gun that works every time, and keeps on working. We can all see that, right? Doug Stanglin recently wrote a story for USA Today about this issue, claiming “Guns made with 3D printers are just as lethal, but aren’t traceable, don’t require background checks and won’t be detected by metal detectors.” Even if you can overlook the fact that Doug failed to use the Princeton comma, and therefore should be imprisoned for life, you can’t overlook the fact that Doug is an idiot. For several reasons. It’s already legal for citizens to build their own guns at home, with no serial numbers and no background checks. Those guns can’t legally be sold, but neither can 3D printed guns. And 3D guns may be just as lethal, the few times they function correctly, but I can build a shotgun out of a piece of pipe that works better and lasts longer. Also, since 3D guns require metal parts to work at all, they can easily be identified by metal detectors. Even the TSA, which fails to find guns more than half the time when tested, has caught four people with 3D guns during the past couple of years. So Doug is, in the vernacular of Bugs Bunny, a maroon. There’s a lot of that going around these days. And then there’s the fact that Doug already uploaded his 3D gun plans on the internet. But then, others have done the same thing, so the feline has already escaped the burlap. But since 3D printers that can make guns cost north of five grand, few criminals will be likely to hit their favorite 7-Eleven with lethal Tupperware anytime soon.